With outstanding views of the town and ocean, Villa Luz, one of the larger villas in Madeira, is a superb villa with great leisure facilities, including a heated infinity pool, large solarium, games room and capacity for 12. Located in a premium tranquil residential area of Funchal, close by you will find all the facilities you may need and easy access to town and, via the expressway, to all areas of Madeira. On the ground floor, a very spacious open-space lounge and elevated dining area with direct sea-view is complemented by a separate private TV room. A fully equipped kitchen features a breakfast table and TV and leads to the covered veranda with outdoor dining table and built-in barbecue overlooking the pool, Funchal and the sea. The whole front of the villa is the south-facing solarium that features a magnificent infinity style heated pool overlooking Funchal and the ocean. Of the villas in Funchal, this one very probably provides the best view of the new year's eve fireworks and cruise ships in the harbour. A large games/leisure room with pool table, table football and a treadmill can be found in the lower ground floor. On the first floor is the Master bedroom with dressing area, en-suite bathroom and private balcony. A further room with a double bed and two rooms each with two single beds share the family bathroom and a full-length south-facing balcony. All offer direct sea-views from this beautiful villa. Off the games/leisure room in the lower ground floor is an interior fifth double bedroom (no windows to the outside) and separate shower room. On the 1st floor bedroom landing is a single chaise longue bed with mattress, underneath of which is a pull out mattress, for the 11th and 12th persons (more appropriate for children - you can see this in the pictures). The largest shopping centre on the island is less than a kilometre away; closer by is a large branded supermarket, shops, bank and pharmacy. The nearest supermarket and bakery/café is approximately 350 metres away and the nearest restaurant 300m away. Fully equipped kitchen. 4-ring gas cooker, built-in electric oven and microwave, fridge/freezer, dishwasher, coffee machine, kettle, toaster, hand held liquidizer. Spacious south-facing pool deck with large infinity style pool. Heating: pool heating is optional and carries a supplement of 150€ per week for a setting of 24ºC, 200€ per week to 25ºC, and 250€ per week to 26ºC, payable on arrival in cash. Pool heating should be requested at least 7 days prior to arrival. Should pool heating be requested after arrival, there is a minimum cost of one week payable from the day it is turned on. The property is gated and there is secure parking for one or more cars inside. The laundry with washing machine is on the lower ground floor. All TV's have a cable connection and feature a large number of channels. 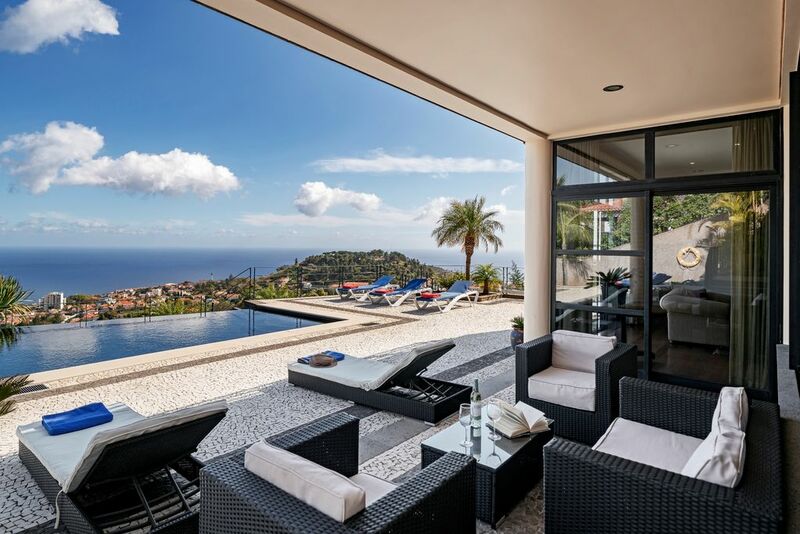 Villa Luz is an amazing villa in Madeira that is built on various levels to benefit from the breath-taking views. Access to the living space is via an exterior staircase, and the villa is therefore not suitable for guests with limited mobility. The prices are based on a 4-person occupancy and supplements apply should additional people join you for any length of time. The next Supermarked is 5 minutes away. This location is highly recommended. A perfect review. Thank you very much indeed. We look forward to your return visit. Thank you very much for your great review. Very much appreciated and we look forward to your return visit. There is no doubt this is a lovely villa with a quite stunning view but it is not perfect. It is furnished with taste and style and short of a sharp knife or two, always missing from holiday lets; there is nothing else you could possibly ask for. Parking is a bit of a chore with more than one car as there is little room at the top of the drive to turn but this is not an insurmountable problem. Two negatives stopped the villa being perfect. Green water in the swimming pool being one. It was very green the day of arrival and was still murky green ten days later despite the efforts of the pool man and his addition of more chemicals. On the last day we used it and from a foot away and wearing goggles, it was still impossible to see the bottom. It would be fair to say the water was not inviting and the pool probably had less use than it would have had it been clear, having paid over 200e to have it heated we were less than enamoured. We had a salt water pool in our house in Canada and the water was always crystal clear, perhaps this one was emulating the Olympic pool in Rio! The second negative was the squatters we encountered in almost every room, including the master bedroom and kitchen. Ants, thousands of the little blighters. They infested my wife’s handbag, left on a chair in the bedroom, were all over the bedside table and were infesting the carpet in the main lounge when Linda came to see us off. At least I was not charged extra for their presence as I was for the one extra person who joined our party. Would I recommend the villa? In all honesty I simply cannot say I would unless there was some cast iron guarantees the pool would be clear and the ants evicted. Would I use the agents again? Yes they were unfailingly helpful at every step of the way, from the initial contact through to the final hand back of the keys on the day we left. They gave first rate service. Unfortunately, there was a problem with the pool pump during your stay, which resulted in the water issue. This was only discovered after your departure. It has not happened before and we are very sorry. Ants can be a problem in Madeira and this was the first instance in Villa Luz. This has been dealt with and we now have regular treatments by a local pest control company. Thank you for your kind comments regarding our service, we aim to please! We stayed one week and enjoyed every minute! Villa Luz was perfect, we arrived on christmas day, had no problem to find our way to the villa on our rented cars. We were met at the vills, everything was ready and the pool was heated, nice. We had a spectacual view of the New Years fireworks! Wow, some extra credits for this. We are very happy with our stay and can highly recommend Villa Luz. Thank you very much for your kind comments and recommendation. The villa is great in every way from the facilities it provides to the views you see, we could not fault it. Our first time to Madeira and such a great place to stay and explore the island from. The ladies in the office were fantastic and arranged everything for us. I would definitely recommend the tours they booked with Alexgo for the local knowledge our driver provided us. If we ever visit the island again we would certainly use "Our Madeira" to book with and would recommend this villa to future travellers. Thank you all for a great holiday we will remember for a long time. There is a large supermarket close by (3 minutes by car) in the shopping mall - Madeira Shopping, which has a large choice of shops, boutiques and a food hall. The centre of Funchal is 2km away and there is a frequent bus service, the bus stop is just along the road. There are various Lidos with access to the sea in Funchal, as well as many pebble beaches around the island. The closest Lido is and the closest pebble beach is 2 kms away. It can be reached by car or public transport. There are bars and restaurants along the promenade. Palheiro Golf, an 18 hole, par 72 Cabell Robinson course is only 15 minutes by car. There is a another 27 hole golf course in Santo da Serra, approximately 35 minutes by car.